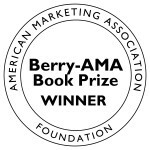 The American Marketing Association Foundation (AMAF) announced How Cool Brands Stay Hot: Branding to Generation Y (Kogan Page) as the winner of the 2012 Berry-AMA Book Prize for the best book in marketing. This award recognizes books whose innovative ideas have had significant impact on marketing and related fields and set the standard for excellence.The selection of the Berry-AMA Book Prize winner and finalists included a five member team of marketing experts led by the AMA VP of Publications Robert Lusch, James and Pamela Muzzy Chair in Entrepreneurship and Executive Director, McGuire Center for Entrepreneurship, Eller College of Management, University of Arizona. The judging panel also included William Cron (Texas Christian University), Michael Krauss (Market Strategy Group), Gordon Wyner (Millward Brown Inc.), and Valarie Zeithaml (University of North Carolina).